A form of motivation and inspiration is playing a former team. Another is playing against a team that has someone good that plays the same position. 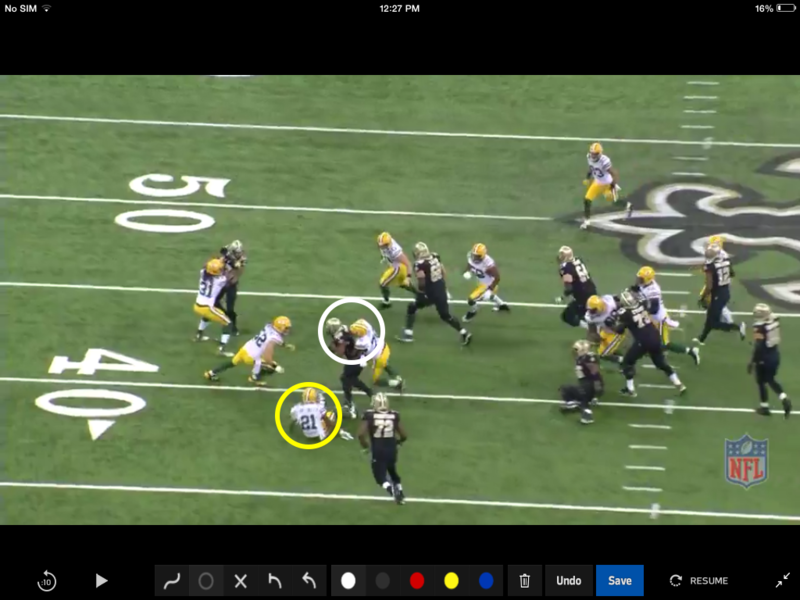 Sunday night we saw Mark Ingram and Eddie Lacy show out. They are former teammates that both shined for The Crimson Tide. I’m sure they had a couple conversations during the week and a bet or two about production. What ever was said between them, rest assured they were motivated to play their absolute best. To me Mark was especially zoned in. His 2-4 yard runs were some of the best of the night. His ability to create some space verses unblocked defenders then finish a run powerfully, was amazing to me. Let me show you a couple. The design of this run calls for one defender to be left for the runner. It’s a form of power without a puller. 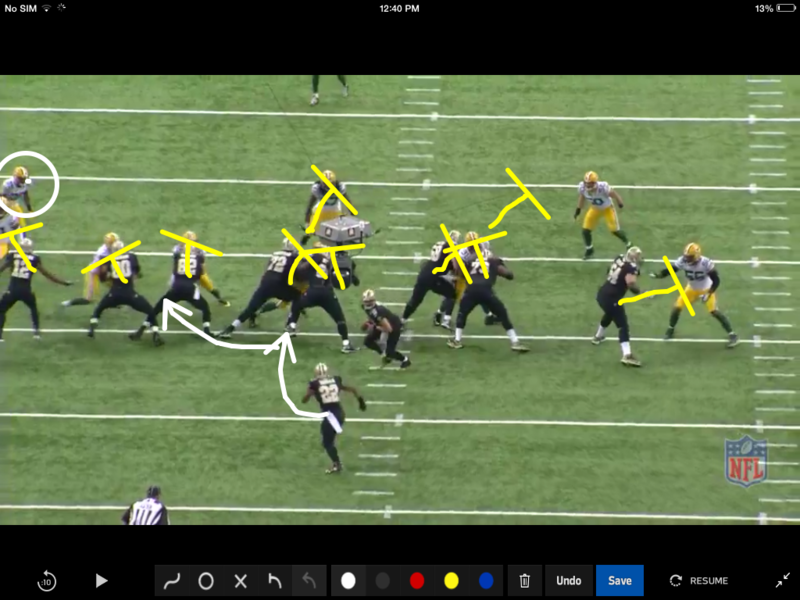 Check the dbl teams inside then the single blocks by the two tight ends and the receiver. Mark (22) does a good job of rolling then cutting to the outside to defeat the defender circled in white. Result 10 yd gain. The next play is a 4yd gain. 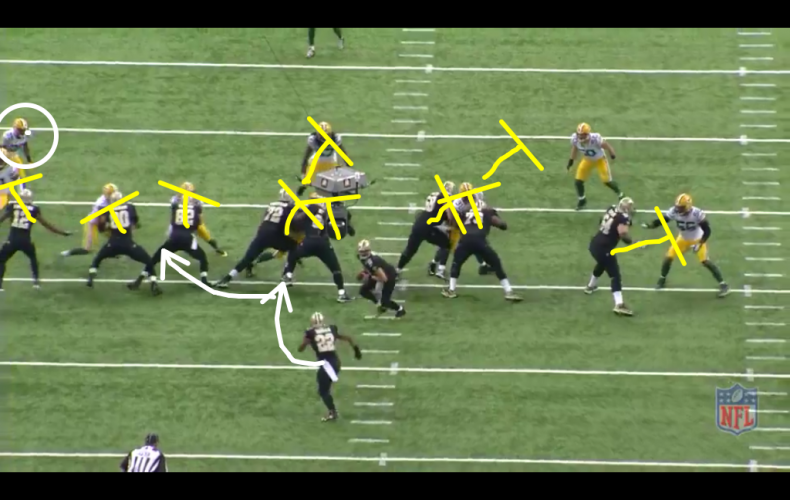 What makes this good is Mark presses the first block enough to get the defense going. He knows based on the number count that the backside is free. 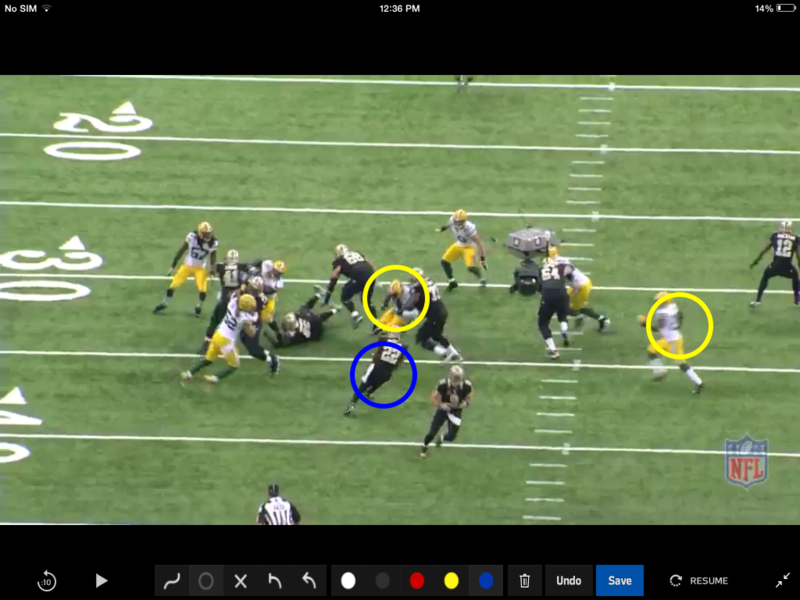 He cuts back defeats the defensive end at the LOS, then powers his way to a four yard gain. Nice work! 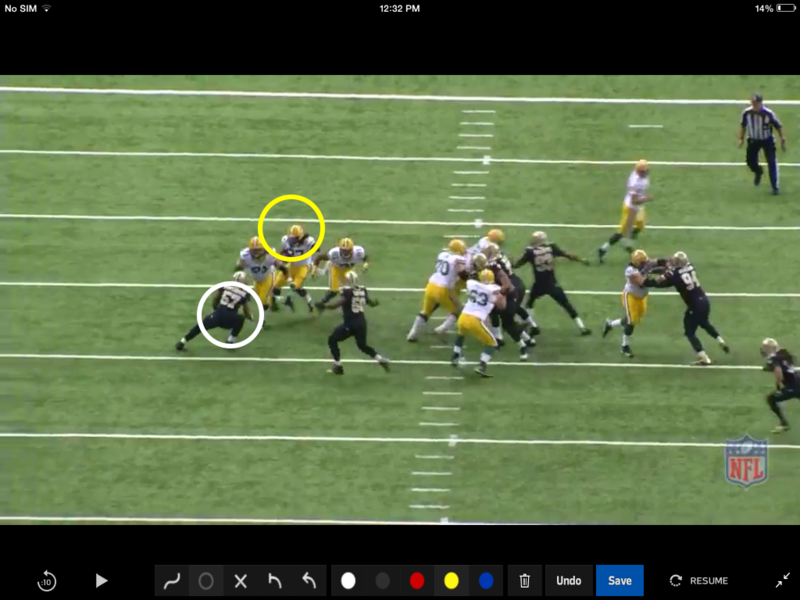 The below clip shows #21 coming in to face Mark Ingram in the hole. This one on one encounter has been decided on the play just above. The defender comes in and ducks his head as you see. Mark cuts up and gains 9yds. The way he felt after hitting Mark and bouncing off, let him know he didn’t want it the next time. The mentality was set! We can’t forget Eddie Lacy although I felt Mark was special on SNF. On the counter play that is pictured, the timing got off some. Eddie had the patience to stay on the back hip of his puller. 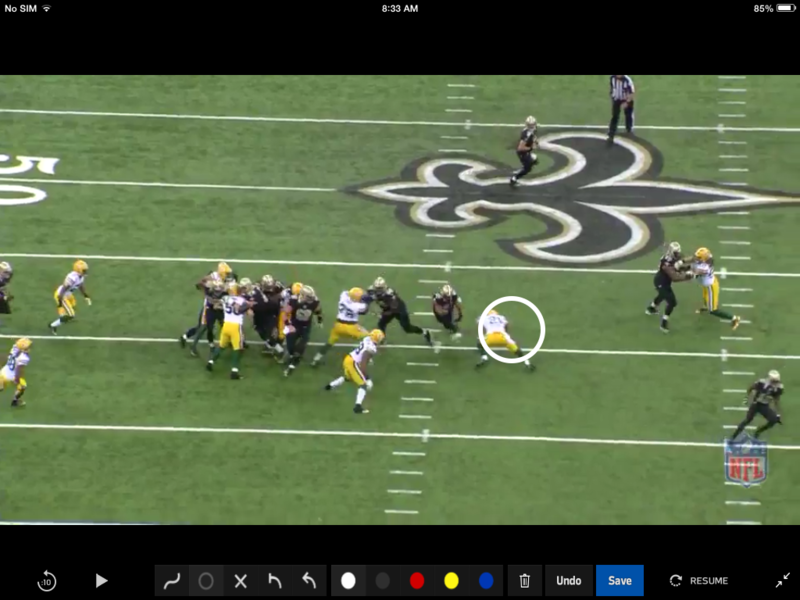 This made the defender peak inside, which allowed Eddie to run for 8-10 yards outside of the peaking defender. Both guys were special but it seemed #22 had a little more in his running Sunday night. Just as it seemed Drew Brees had a little more than AR. The interesting aspect of this is whether or not both guys can continue to play at this level. Can they continue to tap into the source that provided the inspiration to play as they did Sunday? I hope you all enjoy the game within the game.